WICHITA, Kan. Wichita State coach Gregg Marshall spent much of the week trying to convince his unbeaten, 10th-ranked Shockers that Davidson was much better than the 4-8 record it was bringing into Sunday’s game. The Wildcats would be facing their fifth ranked opponent and played much of the season without leading scorer De’Mon Brooks. So Marshall was adamant he did not care a bit about style points after Wichita State outlasted Davidson 81-70 behind Cleanthony Early’s 24 points and 10 rebounds. "Those guys aren’t going to quit; you’ve got to beat them," he said. "That win will look a lot better later this season." Ron Baker had 15 points to help Wichita State (13-0) extend the best start in school history. 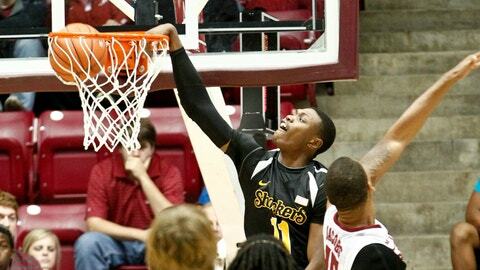 Darius Carter scored 13 points for the Shockers and Tekele Cotton added 10. Tyler Kalinoski had 17 points for Davidson (4-9), while Tom Droney added 12 and Brooks scored 10. As Marshall looked over the stat sheet, he saw similar shooting percentages. What stood out was Wichita State going 28 of 41 on free throws while Davidson was just 11 of 16. Three Wildcats fouled out. "The difference in the game was we were able to drive it better," Marshall said. "That got us to the line. Forty-one free throws is a lot for us." Wichita State shot 27 free throws in the second half, and many were with the Shockers trying to hang on to a slim lead. The Wildcats used a 6-0 run in less than 90 seconds on two running jumpers by Droney and a basket by Chris Czerapowicz to cut Wichita State’s lead to 45-44 with 15:34 remaining. The Shockers stemmed the tide with a 9-2 run. Davidson shot 1 of 7 during the stretch, which was capped by a 3 by Early that made it 55-46 with 12:15 to play, the Shockers’ biggest lead of the game to that point. But the Wildcats stayed within striking distance thanks to 3-pointers. In the next 5 minutes, Kalinoski hit two 3s while Czerapowicz and Brian Sullivan each hit one. Kalinoski’s second 3-pointer in that span made the Wildcats 5 of 8 from beyond the arc in the half and cut the Shockers’ lead to 65-60. "It goes to show you that they’re a really good team," Baker said. "They kept hitting shots and making plays to keep it close." But Davidson went through another drought after that, not hitting a field goal for more than 5 minutes. That allowed Wichita State to pull away behind key plays, like Early’s soaring tip-in over two defenders and Fred VanVleet’s 3-pointer after Davidson had cut the lead to four. "Cle came out of nowhere on that tip-in," Marshall said. "That was a really athletic play." By the time the Wildcats made another field goal, Jake Belford’s 3-pointer with 1:33 remaining, Wichita State had already built a 75-64 lead with 1:44 left. "I thought we really fought in quite an electric atmosphere," Davidson coach Bob McKillop said. "Each time we would get it close, they would make a big shot, like the 3 VanVleet hit. And they are superb on defense." To that end, Wichita State stuck Cotton, its top defender, on Sullivan. After scoring 33 in Davidson’s previous game at No. 19 North Carolina, Sullivan was 2 of 10 from the field and had eight points Sunday. "I thought that was huge, Tekele doing what Tekele does on someone," Marshall said. Wichita State had a significant advantage in points off turnovers, converting Davidson’s 15 turnovers into 18 points. The Shockers had nine turnovers, which the Wildcats turned into seven points. And after getting outrebounded by Davidson in the first half, the Shockers won the rebounding battle 24-17 in the second half. "To hear at halftime we had been outrebounded was motivation for us," Early said. "That’s something we pride ourselves in all the time." The Shockers scored the first half’s final five points, including a tip-in by Carter at the buzzer, for a 36-32 lead.